I was recently given the opportunity to review 3 products from Instanatural. As with make-up, I tend to go in and out of different phases with skincare products; sometimes I don’t use any, sometimes I try and use everything available and sometimes it can be a mixture. For the last few months, I have only been using make-up wipes to clean my face before I get into bed. I can hear you all telling me off now….I know what I should use, I just don’t because it’s quicker to use a make-up wipe! Anyway, when I received these products, I promised myself that I would make an effort to have more of a skin care routine. I was promising myself quite a lot here, as I know from previous experience that having a good routine takes time. I would describe my skin as normal; it’s not too dry and it’s not too greasy. I get the occasional small spot but nothing that bothers me too much. After doing quite a lot of sunbathing over the Summer, I have noticed that my skin is a little dryer than normal. This could also be because of the air conditioning!!?? The Instanatural Youth Express Eye Serum is an eye gel that decreases puffiness, dark circles and wrinkles. I am always a little skeptical of putting cream near my eyes as all the ones that I have ever used have been too heavy and they just felt odd. However, despite this being a gel, which appears to be quite thick when pumped out, it feels light and fresh when applied. You can use it all over your face but I am just using it around my eyes for now. I love the cucumber smell and love the fact that this dries quite quickly. I saw that some people had commented that the product flakes when make up is applied but I haven’t had that trouble at all. You can find this product on Amazon here. 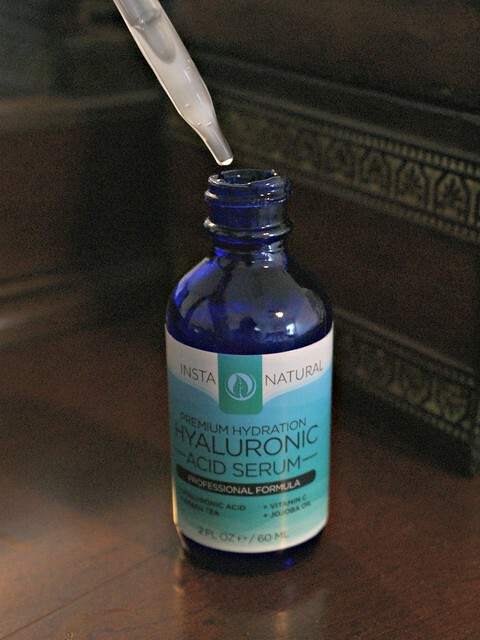 The Instanatural Hyaluronic Acid Serum completely amazed me! I must admit that I was a little apprehensive using this as it has the word ‘acid’ in the name and comes with a pipette, which just reminds me of science lessons back at school! After a little research, my mind was put to rest and the only side effect I could find was allergic reactions. That is the same for any skincare product though so I wasn’t worried! I used a ‘bean’ sized amount for my face and found that was enough for an even distribution. The serum just feels like rubbing water around your face. Again, it has a lovely fresh feel to it and dries almost instantly. Quick drying is great if you are in a rush to apply make-up. The Amazon link is here. The final product up for review today is the Instanatural Vitamin C Facial Toner. I don’t know if anyone else is like me, but I always feel bad after using a toner when I haven’t used one for a while! This toner removed so much more make-up from my face, after I had used a wipe and washed with a cleanser I almost posted a picture of my cotton wool pads but then realised that would be too gross for the blog! Instanatural recommend that you spray this onto your face and remove with a cotton wool pad. I did this a couple of times, but I am not coordinated enough and kept spraying everywhere else instead of my face! Now I spray it onto the cotton wool pad and find that it works better for me that way. I have also used this a couple of times from the fridge…soooo refreshing. The witch hazel and aloe vera smells delicious too 🙂 Find this on Amazon here. Have you ever used any of these products? Let me know what you thought! This is a sponsored post powered by Brandbacker!